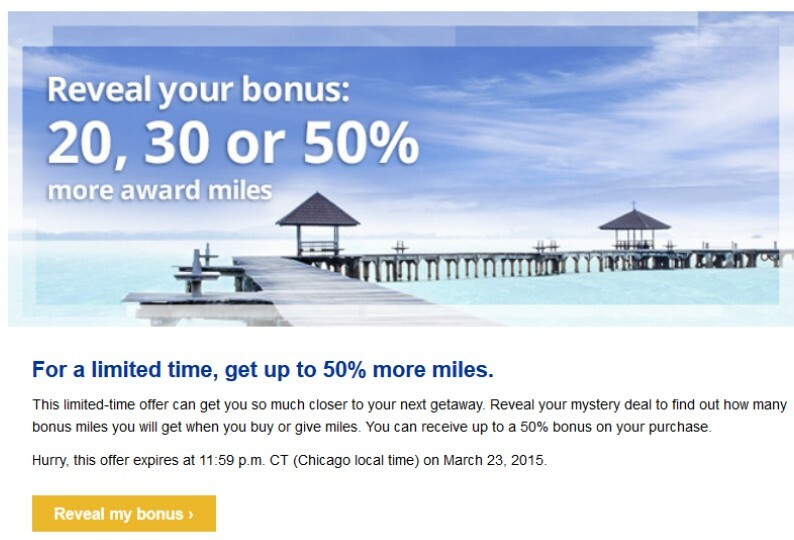 United is offering a targeted bonus on purchased miles that could in an extra 20%, 30% or 50% miles. I received an email from United and clicked on my link. I was offered the 30% bonus, which works out to a price of 2.7 cents per mile. With the recent devaluation of United miles on partner airlines (it now costs significantly more miles for award travel on Star Alliance partner airlines), Ben of One Mile At A Time values them at only 1.4 cents apiece while Brian, The Points Guy, values them at 1.5 cents apiece. So 2.7 cents is not a particularly good price. As usual, your situation may vary. If you only need a few thousand miles to top off an award, now is as good a time as any to buy them. Note that you may only purchase 150,000 miles per year and there are additional taxes and fees associated with the purchase, reducing their value even further. Allow 48 hours for the miles to post to your account. The purchase is processed through Points.com so it will not count as a United Airlines purchase for credit card category purposes. The offer is valid until 11:59 PM Central Time on 23 March 2015.